I really think RightWay has had a significant part in our business. They just stood us up and broadened our horizons a lot more than we knew we could. Our business is called Moana Stand Up Paddle Boards. 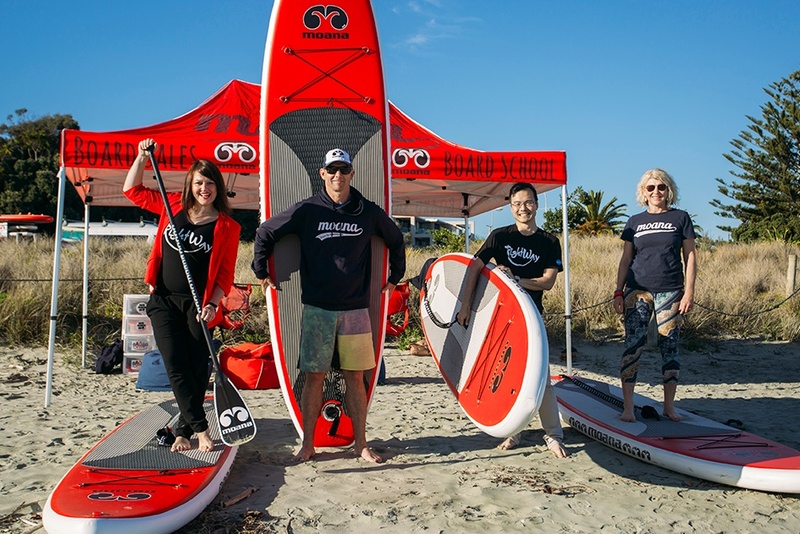 We started the business about six and a half years ago just by selling paddle boards. We got into paddle boarding, fell in love with it, went to buy a board and found them incredibly expensive. Then Toby found he had this amazing ability to design boards, so that’s where we started off, to make boards for Kiwis, but also at a reasonable price so families could afford to buy them. Then three years ago a beach hire business came up for sale at Tahunanui Beach, which we bought and rebranded with our own boards. From October through until April we hire boards out, provide lessons, and hold group events. One big thing with our company is we demonstrate our boards. It’s a really big part of our business, and it’s where the beach works really well. Customers will phone us and say I’m not sure if I like the “Kapai” or the “Wahine” and we’ll say, well come down and meet us and we’ll get the boards out, and they can go out on the demo boards and see what they think. Then we’ve got the beach hire. Down the beach we’ve got a massive tent with big bright red bean bags, we’ve got music playing, it’s just a really social place to come and visit. We definitely want to grow it. We want to increase our board sales, we want to extend our season on the beach with customers and get more people involved. We want more people to try and buy our boards. We want to make more money so we can extend the business, basically. Making more money isn’t our key goal, though. For us it’s more about enjoying the journey, but as the business grows we’re finding there’s more expenses, so we need to be making more profit to cover those. We both have other jobs. I’m a nurse and Toby’s a tutor, so working together with our jobs and building the business has been a challenge. Also the things out of our control, like the weather. We had a really windy summer and that effected the business. I think probably the biggest challenges when we started was that I felt we needed to be good at everything and I soon realised that we weren’t. And that’s where RightWay came in with Olivia, and she took on the finances for us. She’s also pushed us to try new things. We started connecting with people to help us with our business that were really good at what they were doing. Those relationships helped us solve some problems and drive things forward. So with Olivia from RightWay, she brought us together and talked about profit and loss, she’d urge us to push the boundaries and think of things we hadn’t. In the summer when we had a lot of unsettled weather, we were worried that we weren’t making any money so we went and met with her. She did all the paperwork, and had a look and said, actually, you’re doing well! We’ve got an ecommerce site, we use a company called esquare, we’ve just got people around us. An amazing team who are really good at what they do. Very. We’ve probably learned that as we’ve gone along. The business evolved. Last year we put an entry through for the Nelson Chamber of Commerce Business Awards, and that was fantastic as it was basically writing a few thousand words of business plan. We’ve probably learned about planning as we’ve gone along. That one’s pretty easy. We were working really, really hard for other people, and we decided we wanted to work hard for ourselves! What’s been really exciting is the business has grown, so Toby has cut back his time tutoring, and that’s made a massive difference as it’s allowed him to focus a lot more on Moana. I work part time and so that’s also allowed me to do my office days more easily. We kind of feel we’ve got a good balance, and when we are at the beach with our customers we both give each other time to go paddle boarding, so we do have a good lifestyle. We met through a mutual friend, actually. Olivia joined the RightWay team and we were one of her original customers. The Moana Paddleboards business wasn’t that big then and it was at a crunch point. We’d just bought out some business partners and she offered her services and expertise. It’s transformed our business, working with RightWay. Because Olivia set up such good systems it allowed us to invoice our customers in a really professional way, we could just go into Xero and see what was owed, she went through all our financial statements and gave us a really clear pathway about what to do. But it’s the business mentoring that’s fantastic. RightWay gets very invested in your business. They do a lot more than accounting - they tick lots of boxes. I’ve just seen Olivia actually, and given her a big hug! Completely. For us, we’re talking about the stresses and the things we know we’re not good at. We can hang out on the beach, get our customers into paddle boarding, and not have to worry about the GST and our tax returns. We can phone and make a booking and just say hey, can we run something by you. For us as a couple, we’ve both got ideas and it’s nice to have a neutral person who can listen to them and point us in the right direction. Being in business is really exciting, and to be able to put your own values into the business is really neat. I think when you can get to that you’ve got an amazing team that believes in your business and are passionate about it as much as you, that’s when amazing things can happen. I really think RightWay had a significant part in our business. They just stood us up and broadened our horizons a lot more than we knew we could. We can hang out on the beach, get our customers into paddle boarding, and not have to worry about the GST and our tax returns.